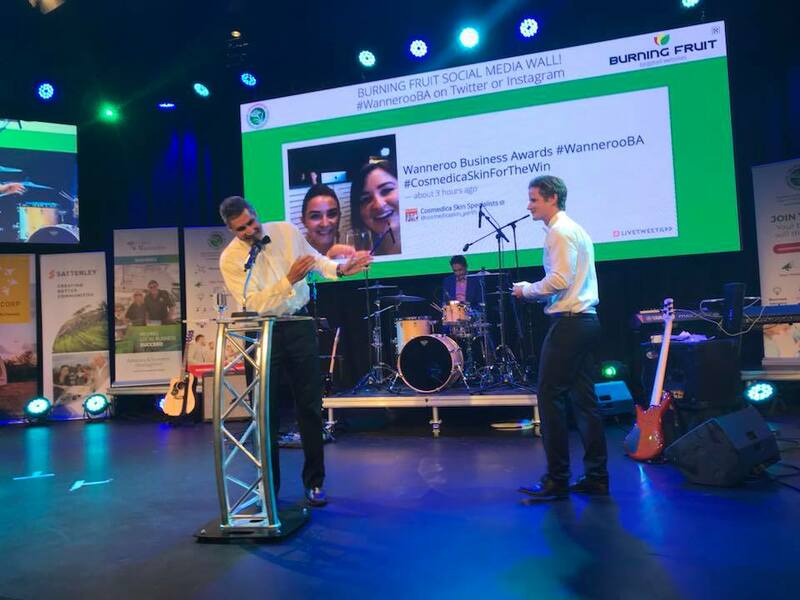 After hearing mixed opinions of the value of having a social media wall at business events, I was sceptical to hear our local business community was organising one for their annual awards night. I could understand a room full of tech start-ups wanting to open their Twitter apps to share their learnings at an innovation symposium. However, with small businesses, some with no active presence on social media, wasn’t it destined to be a big flop? Visions of members frowning upon others because they had their heads buried in their phones was making me feel nervous in the days leading up. Had the organiser made the right decision? 1. The event organiser did an amazing job of promoting the event and hashtag beforehand. This got the digitally savvy businesses in the group congratulating other on their award nominations before the night. 2. They chose the social media wall app: Livetweetapp which displays posts from Twitter and Instagram widening the audience of users. 3. All posts were moderated before appearing on the wall. We’re all decent people, but it’s good sense to be vigilant. 4. The screen was humungous and positioned centre stage behind the award presentations. There was no ignoring it. 5. Beer and wine was flowing amongst the 100+ friendly business owners. Dare I say it? The live wall made this event even better than ever. Tears of laughter and silliness ensued as we saw each other’s cheesy grins appearing on the big screen. It was certainly a night to remember and will perhaps become the norm for this annual knees-up. Maybe it’s not for every event but if you have a room full of great people celebrating each other’s wins, it’s a thumbs-up from me.